Northern California is world-famous for its incredible wineries, spectacular scenery and fabulous hotels. Sonoma Valley is a one-hour drive from San Francisco, which makes it a popular weekend getaway from the city. Napa Valley, located just north of Sonoma, is a beautiful weekend destination, offering vacationers a choice of wineries, delicious food and spas. Our list includes best places to stay in St. Helena, Yountville, Healdsburg and other charming towns. 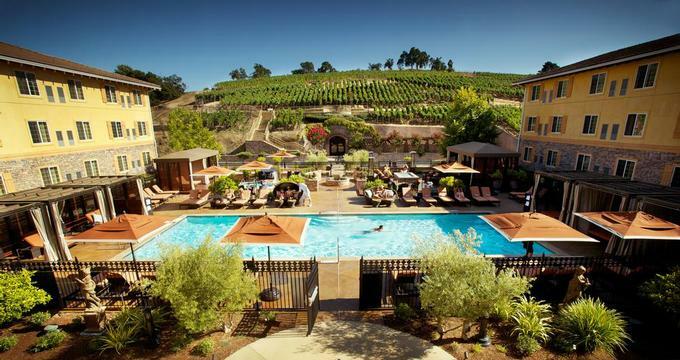 Here are 15 perfect California wine country vacations. The Meritage Resort and Spa is a Tuscan-inspired wine country getaway with 502 rooms, suites and vacation rental rooms. Guest rooms have high ceilings, luxurious bathrooms and plush beds. Ask for a room with a balcony overlooking the vineyard so that you can enjoy a delicious breakfast with a view. Spa Terra at the Meritage Resort is a unique 22,000-square-foot spa located in the Estate Cave 40 feet underground. The spa is the ultimate hideaway for couples with its 12 treatment rooms, lounges, whirlpools and water walls, all underground. Siena Restaurant has a beautiful outdoor patio and an indoor dining room with murals depicting the Palio di Siena horse race. Rooms start at $209 per night. More weekend destinations: 21 Best Things to Do in Healdsburg. 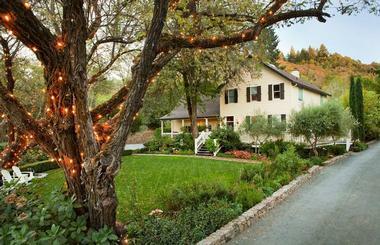 Farmhouse Inn is a luxury California bed and breakfast in Sonoma's Russian River Valley wine growing region. Tour a famous winery on your weekend getaway, hike along farm trails, visit the Armstrong Woods State Reserve to admire giant redwood trees, or take a scenic drive down the coast. Other activities include canoeing along the Russian River, shopping, ballooning and biking. Schedule an appointment at the Spa at Farmhouse and sample treatments that incorporate herbal and all natural spa products. If you are planning a romantic trip, a side-by-side massage for couples can be arranged. The 25 luxury guest rooms and suites at Farmhouse Inn are individually decorated, some with wood burning fireplaces, private saunas, and double jetted tubs. The restaurant has a focus on organic and sustainably farmed fruits and vegetables and is therefore able to create intensely flavored dishes. All of the ingredients are literally gathered from farms on the same road. The area surrounding the property has some amazing scenery which makes the drive all the more special. If you decide to fly, the Sonoma County Airport is not far from the hotel. Rates start at $495 per night. Hotel Healdsburg is a stylish getaway in downtown Healdsburg, featuring gourmet dining, a spa, outdoor pool and 55 elegant accommodations. Explore Healdsburg with one of the complimentary custom bikes offered by the hotel. Charlie Palmer's Dry Creek Kitchen at Hotel Healdsburg serves seasonal wine country-inspired cousine paired with award-winning wines. Pizzando is an Italian eatery offering great pizzas, vegetables and meats. Guests receive a complimentary breakfast in the morning. Rooms start at $280 per night. El Dorado Hotel & Kitchen on the Sonoma Square offers a central location for exploring Sonoma Valley. The hotel has a solar heated swimming pool with plush cabanas, open from May to October. The 27 stylish guest rooms feature complimentary WiFi, iHOME iPod clocks, reusable water bottles and Certified Organic personal care products from EO. El Dorado Kitchen serves fantastic seasonal dishes with ingredients from local Sonoma farms. The outdoor courtyard lets you enjoy the surrounding beauty of California's Wine Country, while indoors you can admire all the work that goes on in the open kitchen. Rooms start at $205 per night. Explore the scenic Sonoma Wine Country while staying at the Honor Mansion which has just 13 luxury guest rooms on a four-acre property, complete with a pool, croquet and bocce ball courts, putting green, tennis and basketball. After a day of wine tasting and shopping in Healdsburg, treat yourself to a relaxing massage in the privacy of your room. 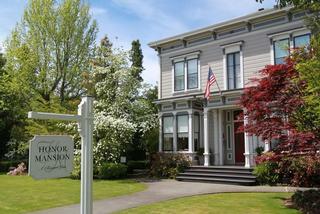 Guests staying at The Honor Mansion have to be at least 16 years old, which makes it a calm getaway for couples. The Vineyard Suites are the most luxurious, featuring a two-person spa tub on the private patio. Rooms start at $240. 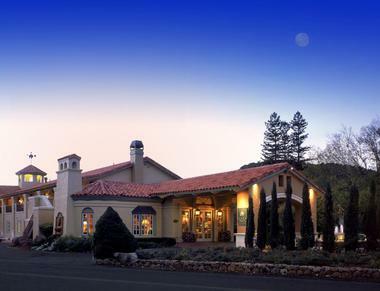 Kenwood Inn and Spa is a Mediterranean-inspired getaway in Sonoma wine country. 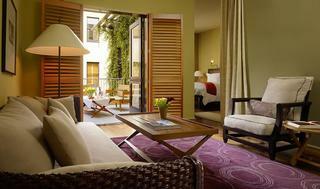 The inn has 29 guest rooms and four luxury suites, furnished with custom-made furniture from Italy. Gas fireplaces and unique art work create a romantic atmosphere. 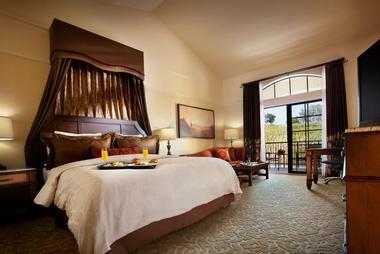 Ask for one of the rooms on the second floor to enjoy the best views of Sonoma. Kenwood Inn has two heated saline pools, a Jacuzzi and a spa offering treatments from Caudalie, utilizing vine and grape seed extracts. The spa has four massage rooms, a facial room, Wine Bath with vineyard views, a fireplace lounge and a terrace overlooking the pool. The Restaurant at Kenwood Inn serves Italian dishes using fresh ingredients from local farms and the hotel's garden. Rooms start at $275 per night. 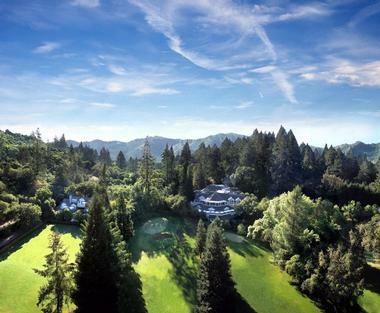 Meadowood in St. Helena is a luxury 250-acre resort with fabulous restaurants, a diverse choice of activities and secluded accommodations surrounded by calm country views. The resort has 85 cottages, suites and lodges with romantic touches such as fireplaces and outdoor terraces. Meadowood's restaurants serve a seasonally changing menu using ingredients from the resort's own garden. If you are celebrating a special occasion, the Chef's Tasting Menu at the Restaurant is a must-try. The resort has a nine-hole golf course, a 11,000 square foot spa, 7 tennis courts, croquet, two swimming pools and whirlpools. Cottages start at $600 per night. 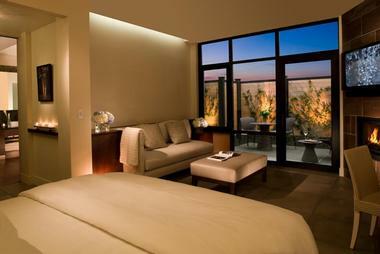 Auberge du Soleil is set in the heart of Napa Valley, surrounded by rolling hills and vineyards. The hotel has a beautiful outdoor pool, Auberge Spa and an incredible outdoor sculpture garden. Terraced guest rooms and suites feature Mediterranean-inspired decor, original contemporary art and private outdoor terraces for relaxing with a view. The 7,000-square-foot Auberge Spa utilizes ingredients from California's Wine Country. Arrive early for your treatment to enjoy the signature water ritual: a soak in three springs overlooking the Napa Valley vineyards. 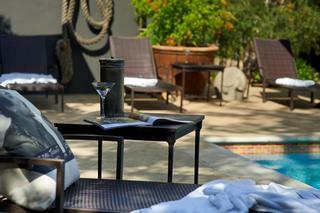 Couples can book the luxurious Melisse spa suite with a fireplace, private outdoor garden and its own hot spring. Rooms start at $700 per night. The cottages at The Carneros Inn are spacious and romantic, complete with wood-burning fireplaces and outdoor terraces with gas heaters. Explore both Napa and Sonoma Valleys from this charming inn which is located between the towns of Napa and Sonoma. Book a table at the Hilltop Dining Room which serves wine-country inspired cuisine with spectacular views of the vineyards. The Carneros Inn spa offers a diverse menu of treatments, including massages, hot stone therapy and aromatherapy. The outdoor swimming pool is a great place to relax after your spa treatment. Cottage rates start at $360 per night (707-299-4900). .
Bardessono in downtown Yountville is a romantic hotel with 62 guest rooms especially designed for couples. Each room has a gas fireplace, luxurious bathroom and a private courtyard or balcony. The bathroom has a concealed massage table which makes it easy to enjoy massages in the privacy of your room. Bardessono is a eco-conscious getaway with a LEED Platinum certification. Environmental initiatives include non-toxic, non-allergenic materials used in construction, organic linens, eco-friendly cleaning supplies, recycling and composting. Lucy Restaurant & Bar is one of the best restaurants in California's Wine Country, serving an innovative menu based on fresh local produce. Plan a romantic proposal or celebrate a special occasion at Bardessono. Rooms start at $450 per night. Napa Valley Lodge is a romantic spa getaway for couples located in the heart of the Napa, California, surrounded by vineyards and calming country views. The hotel has a Tuscan-style exterior, a pool, spa, sauna and fitness center. There is a beautiful fountain in the garden courtyard. The hotel offers a complimentary breakfast buffet, and tea in the Lobby in the afternoon, giving guests the opportunity to get acquainted with other hotel guests. Every Friday, Wine Tastings are held where guests can sample wines from local wineries. For those who prefer privacy and quiet time, the library offers over 400 different titles. The lodge has 55 guest accommodations, including five suites with a two-person soaking tub, ideal for couples looking for romance. The town of Yountville offers a number of fun activities - wine tours, golf, biking, balloon excursions and shopping. The hotel concierge stands by to assist guests with dining reservations. Doubles start at $279 per night. 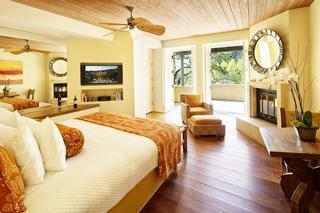 Calistoga Ranch is a luxury vineyard retreat located in the Upper Napa Valley near the historic town of Calistoga. Take a tour of the vineyard and the wine-making facilities, and unwind at the Bathhouse, the hotel's wellness center. 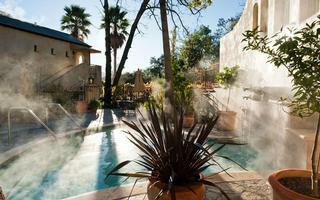 The Bathhouse features natural spring-fed mineral pools, wet/dry treatments, and programs for well-being. The open-air fitness facility overlooks the scenic Lake Lommel. If you prefer, you can request a massage in the privacy of your lodge. The ranch has 46 free-standing lodges with forest and mountain views. Relax next to the fireplace, snuggle into the down duvet and enjoy the natural surroundings. 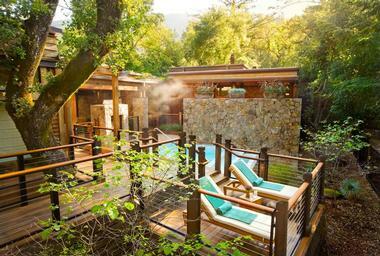 Solage Calistoga is a Napa Valleygetaway offering 89 eco-friendly studio accommodations and one of the top spas in the U.S. From treatments at the spa to gourmet dining, the hotel offers plenty of relaxation to help you rejuvenate on your trip. Guest accommodations have outdoor patios, vaulted ceilings and a pebble stone floor shower. Each studio comes with two cruiser bicycles which are great for exploring the surrounding area. Locally made bath amenity products are a nice touch. 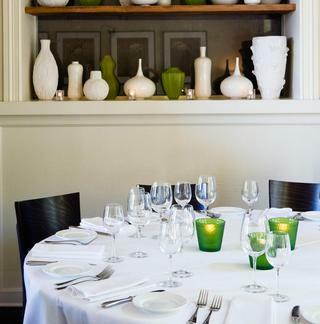 Michelin-starred Solbar is a popular Napa eatery serving innovative cuisine that incorporates the freshest ingredients, including vegetables and herbs grown on the property. 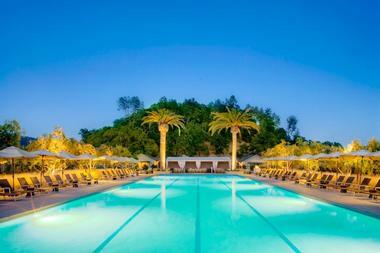 There is an outdoor pool with luxury cabanas, surrounded by 22 acres of Northern California wine country. Room rates start at $375 per night. 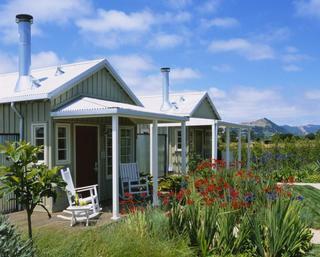 More places to stay: SENZA, a Luxury Hideaway in Napa. 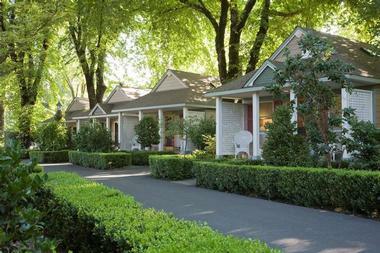 Cottage Grove Inn offers Napa Valley visitors the experience of staying in one of their 16 private cottages. Each cottage is spacious and comfortable with fireplaces and a private porch. Morning finds a fine breakfast of a variety of quiches, organic yogurts and honey, fresh fruit and baked goods. In the evening, wine is served with crackers, cheese and various spreads. While still being in walking distance to the shops and restaurants of Calistoga, The Cottage Grove Inn is removed from the main street in a quiet neighborhood. Bikes are provided if guests wish to take a spin.